Udupi, April 13, 2019: Lalaji R. Mendon, Kaup MLA, said on Friday that the fishermen community in the three coastal districts had always believed in ‘Hindutva’ and supported the Bharatiya Janata Party (BJP) in the parliamentary elections barring a couple of times when there was confusion in the party. 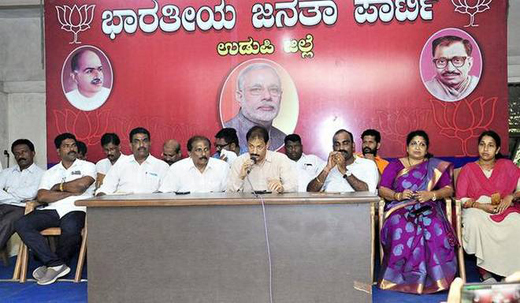 Addressing presspersons here, Mr. Mendon said that even in the 2019 elections, the community will back the BJP and the party’s candidate Shobha Karandlaje will win by at least 2 lakh votes in the Udupi-Chikkamagaluru parliamentary constituency. The ‘Hindutva’ factor will also help the BJP candidates, Nalin Kumar Kateel and Anantkumar Hegde, to win from the Dakshina Kannada parliamentary constituency and the Uttara Kannada parliamentary constituency, respectively this time, he said. Mr. Mendon said that the BJP had promised to provide a separate ministry for fisheries. Presently, the subject of fisheries came under the Union Ministry of Agriculture. But the party had responded positively to suggestions made by fishermen delegations that there were nine coastal States and a separate ministry was needed for fisheries to tackle the various problems of fishermen. The National Democratic Alliance (NDA) government had already released Rs. 400 crore for the construction of fisheries harbours at Hejmady and Kulai. It had also encouraged the setting up of ice plants and fish processing units through various packages. Priority was given to the construction of ports in the last five years under the Sagarmala scheme. These ports were provided with road connectivity. This had generated a lot of jobs, he said. Raghupati Bhat, Halady Srinivas Shetty, MLAs, Yashpal Suvarna, President of Dakshina Kannada Fish Marketing Federation, Mattar Ratnakar Hegde, President of district unit of BJP, were among those present. Earlier, the members of Udupi unit of BJP took out a cycle jatha in the city.